Please find attached several pictures of my pool, taken at various points around the pool, showing rusted parts. It is an Ovation Pool, Alexandria model. I understand that Vogue Pools took over Ovation but I contacted them and they do not have parts. According to the instruction manual these are called metal stabilizers which go over the coping which sits on top of the pool wall and liner. Also, you will see that the top plates are rusted as well. 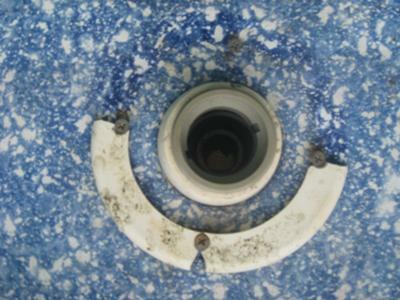 I have also enclosed a picture showing one of the top rails that has cracked. Does anyone know where I can get these parts? I purchased a swimming pool from craigslist and of course the seller said all the parts where complete. Well the plastic coping strips, screws, bolts and nuts are all missing.I was able to get the coping strip. But have no idea what size of screws, bolts and nuts to buy. If anyone has a manual can you email me the sizes. I would greatly appreciate it. Wish me luck I'm hoping nothing else is missing. Best of luck to you all. Hi, we bought an Ovation above ground pool on craig's list and need help finding directions to put it together. Where can we find the directions? We have a 15 foot round Ovation pool. 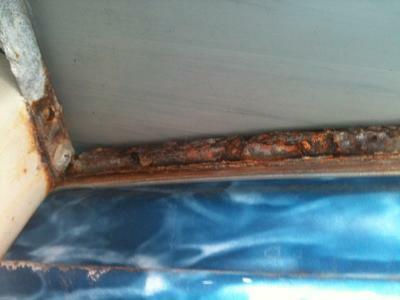 All of the top rails are rusted and need to be replaced. The pool was purchased in 2000. Please advise where we can purchase these parts. 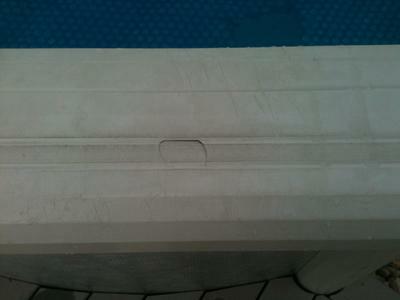 I am looking for the top ledges for an Ovation Palladian 18 round pool. They are all rusted and have already painted them with rustoleum paint two yrs ago, need new ones. The part # is 02146. Anyone know where I can get them? 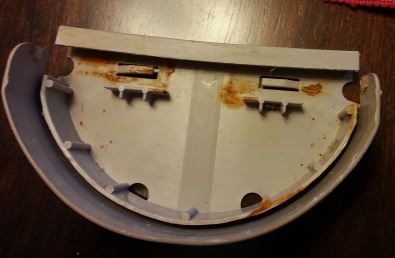 The "nut" and plate cover for my inside water return parts broke. Can anyone help me top find replacement parts please? I had the exact same thing happen. I fortunately (or unfortunately) was in need of a new liner. When I replaced the liner, I duct taped in a piece of flashing (thin metal) over that ridiculously large hole and made a new hole nearby to accommodate a standard size return. I couldn't find that piece and if you do, it'll just break again because it's too thin for the job it's supposed to be doing. I have an ovation pool and need 7 of the bottom plates that connect the rail and the vertical supports, they are plastic. 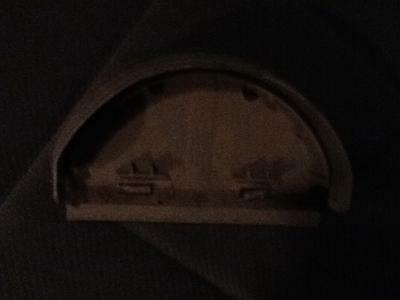 The supports are basically a half circle and they are 6.5 inches wide and 4.25 inches deep. I saw a post on here that Jason had the same problem needing the same part # 04009 from ovation manual. I have yet to find an ovation pool web site can anyone help me, or can Jason let me know what he found? I need to find a place to buy about 7 top plates for my pool. I was given an Ovation Palladiem 27' round pool and néed four bottom plates for it. Any help would be appreciated. 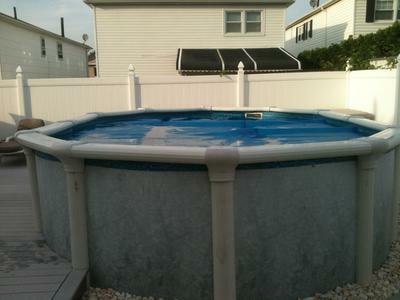 Since Ovation went out of business years ago, has anyone had any luck finding suitable replacement upper wall stabilizer rails for these pools? I'm replacing my liner, and I need new rails. Looking for one coverplate and approx 5 cover plate buttons to hide screws. Please send part numbers if you have them and/or photos of parts needed. If I do not have them, you can send me the parts that you need and we will make them for you in resin. Can you help guide me in finding a replacement side wall for an 18' above ground Ovation pool? 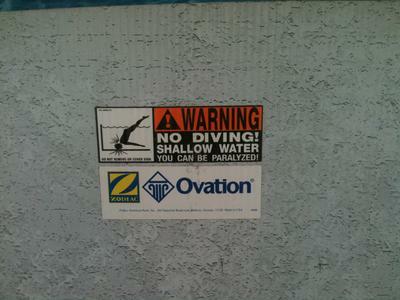 I have a Zodiac Ovation Palladium above ground pool, 18' x 33'. The top rails were damaged during a recent hail storm. I would like to replace all 20 top rails. Is there such thing as a universal top rail or will they need to be Zodiac/Ovation Pool specific? Can someone tell me how I can get some parts for my ovation 27' pool part number 04009? It's the bottom plate for the upright. I am looking for replacement rails for my Ovation Rio II Galeria 18' round pool. Can someone tell me where I can find them? I have an 18'round Ovation above ground pool and need to find the metal stabilizers. They are all rusted! Any advise as to where I can go or call to get these parts would be helpful.